My parents dropped off some old stuff that I had left at their place since I moved out. Moving from apartment to apartment over the last few years didn't allow Dora and I much room to keep extra stuff. Among the things they dropped off was a huge portfolio of most of the work I had done in college. Some stuff brought back a lot of memories good and bad, other things like exercises I didn't even remember doing. The weird thing was that as I was looking through this stuff I realized everything seemed rushed. I remember at the time having like 4-8 projects a week all due within the same amount of time so there was a lack of care in terms of actually having fun with the mediums and projects, everything looks like it was just made to pass the grade. So it dawned on me: Why don't I try something new? Why don't I experiment with a medium I haven't used before just for fun? Luckily there was a sale going on this weekend at the local art supply store. 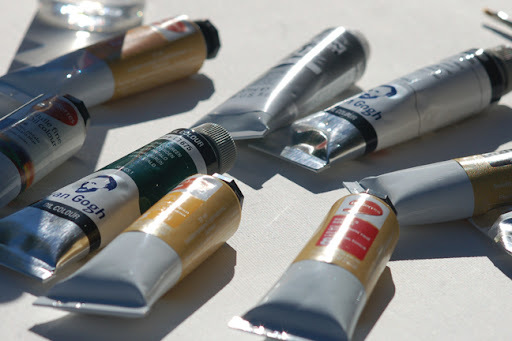 So I read up online on how to go about starting to oil paint and I picked up the following tubes of paint. I still have no idea what I'm going to make but I'm quite excited to try something different. I've been looking at a lot of Gottfried Helnwein art and Mark Ryden art lately, so I can't wait to test out some things. I'll keep you posted.